So in the Spirit of Women’s History Month we decided to close the month out with another segment highlighting some talented women who are clearly on the path to create their own history. We at Curated Vibes Group thought about what industry of amazing African American and Latina women we should highlight closing the month out in, and we decided the one industry that is heavily male dominated and overlooked when it comes to pure talent. This Coney Island, Brooklyn Native can be found at Evil & Love tattoo shop located in Greenpoint Brooklyn. She has been tattooing for 7 years, but her artistic talents do not end in tattooing. She also specializes in graphic design as well as canvas paintings, which has been showcased at art events within the shop. This talented little creature develops masterpieces using illustrative style and watercolor techniques for tattoos. This Philadelphia Native is a self taught well versed talented artist. Tattoo, Painting AND Recording Artist. Her talents have brought her to different cities, designing unique dope custom pieces on apparel, and collaborating with Cork N Create in California for themed painting classes like Puff Puff Paint. Keep your eye on this traveling artist to see when she pops up in your city to soak up her skills! Stationed at City of Ink in HotLanta Miss. Snax (and doesn’t she look like one as well?!) has been tattooing for over 5 years now as well. She creates art as a joy for others to enjoy and to share her gifts with those who truly are open to it not just for amusement. Her style focuses on an eclectical visuals. AKA The Witch Doctor, probably for the way she can easily steal your breath by one look. She is a walking masterpiece and another wandering talented soul. Learning her craft across the seas in Sweden over 7 years ago she is another Visionary Artist. This multimedia artist is currently stationed at thee legendary Saved Tattoo in Brooklyn and she is widely known for her innovative combination of Chicanx imagery with fetish iconography. When she is not painting murals on bare skin, sketching with ball point pens, or creating artistic installations you can find her editing for her independent publishing house Discipline Press a multimedia venture dedicated to reconnecting popular imagery of counterculture with the narratives and history of those who create it, with a focus on excavating experiences of marginalized peoples within subculture. We wish we could provide you more details about this amazing artist but her portfolio speaks volumes to what this Spaniard can do. She is currently sponsored by Balm Tattoo, Radiant Colors and does SICKENING Color work! If you ever are abroad in Spain or Europe take a peek to see where she may be floating around. 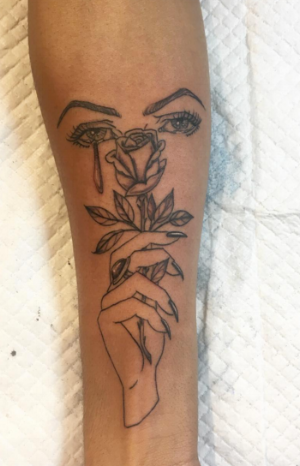 This international artist is currently rooted in Washington D.C and her 10 plus years experience has made her a specialist in a number of styles, but her sweet spot is Japanese inspired and fine-line work for dark skin. However, this Viber has dove into an exciting part of her career and has opened doors to Little INKPLAY Shop, a creative space. This space will have open doors, welcoming others to meet-up and explore their artistic voice, creativity, and self-love. This talented artist is the co-owner of Diving Swallow Tattoo in Oakland CA and has been tattooing in the Bay Area since 96 specializing in black & grey, full color, dot work & portraits. Dope thing about her shop? All female artist and they are gender queer. Based in NYC at the Manhattan shop Red Baron owned by a Dominican Queen (who co-owns this shop with her husband who is located as her neighbor to separate the male artists and the females with one door). Sue specializes in BlackWork, Grey, and Geometry. This breathtaking walking art piece is another one we could not conjure up enough words but one look at her detailed intricate work is enough to blow your mind. Now we could never highlight some dope artists without paying homage to the most respected, one of the first African American Tattoo Artist AND owner of THEE oldest tattoo shop in NEW ORLEANS! Miss Jacci has been tattooing since the 70’s! Back where there was no copiers or printers and they stenciled everything by hand then inked. Jacci is STILL tattooing and specializes in correction and color.